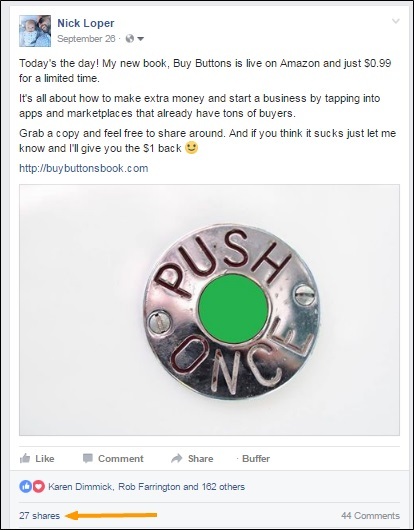 Last month I launched my latest book project, Buy Buttons, out into the world. On Day 1, it became an Amazon bestseller and has gone on to collect 75+ 5-star reviews and sell more than 2600 copies. My process was much more involved this time around than it was two years ago for the launch of Work Smarter. A lot has changed during that time so I was excited to put some new ideas to the test. The editing, formatting, and cover design. I’ll also share what I spent each step of the way and how much the book has earned in royalties so far. Like Work Smarter, Buy Buttons started as a blog post idea. After my conversation with Glenn Carter about the sharing economy, I was on the hunt for a massive database or directory of all the different peer-to-peer apps and platforms people could use to make money (like Uber, Airbnb, and TaskRabbit). When I couldn’t find that resource, I decided to create it. The resulting post included more than 200 different sharing economy platforms and marketplaces ranging from the household names to the obscure. It took 40+ hours to research, compile, and format, but the post did really well. It got a lot of traction on social media (2000+ shares) and is the most popular article on the site this year (45,000+ pageviews). The performance of that post served as validation that these “marketplaces” were a hot topic if I could expand on them even more and include more case studies, success stories, and examples. Members of my mastermind encouraged me to take the next step and turn it into a book. To give you an idea of timing, this was at the end of June. I gave myself a month to finish the first draft with an estimated length of 25,000 words. I budgeted in time for editing and revisions, creating and setting up a lead magnet, cover design, and formatting. I originally targeted a September 19th launch, giving myself about 2.5 months to ship this thing. I ended up launching on the 26th instead, but without this project timeline the book might still not be out! Creating this timeline plan was really helpful. Even though all the deadlines were self-imposed, I’d convinced myself they were real. After the initial excitement and honeymoon phase of any new project, the reality sets in: this is going to be a ton of work! I was able to do some content outlining and general structuring on the way home from Chicago (because airplane time is great for productivity), but found myself intimidated by the process and procrastinating once I got back home. Every Monday afternoon I made a date with myself to spend that time on the book. 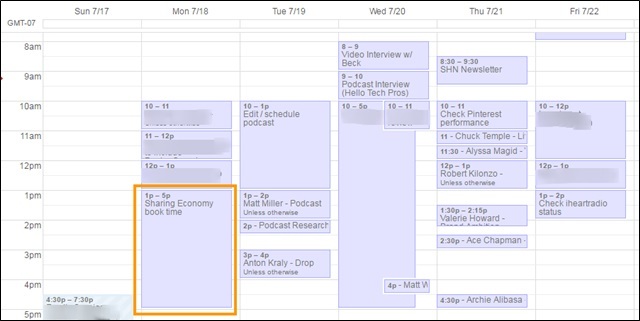 Originally I thought it could be a 4-hour a week project–the perfect side hustle case study–but I ended up spending more time than that as the weeks went on and I got closer to my launch deadline. The other thing that was helpful was creating an outline first, and then working to fill in the gaps. I find that so much easier than starting completely from scratch. In fact, I’m using the same system for this blog post. I definitely did not write the book in chronological order, but instead “picked off” sections that sounded interesting or I was motivated to get done at the time. 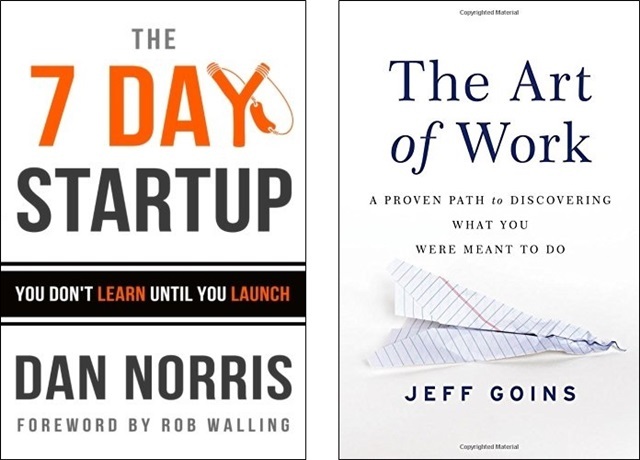 If the idea of writing a book is daunting, you may be closer than you think. For Buy Buttons, I literally copied and pasted the 7500 word sharing economy post into my Word document. Of course I rearranged, re-wrote, and added to it, but that immediate boost in the word count was helpful and motivating. Using that same strategy, I dug into the blog and podcast archives to see what other “Buy Buttons” stories I could find. There were lots! In total, the book ended up being 46,000 words (way more than the original 25,000 I’d estimated! ), but more than half was already drafted in the form of blog posts or podcast notes. And of those 2600 copies sold, no one has complained yet. Fears unfounded. The bigger challenge was filling in the case studies and stories for the platforms I didn’t already have my own experience or connections for. I found help in three places. The first was reaching out to the platforms directly. I usually used a press email (and actually already had a few of these in my inbox from marketing the 200+ ways post), and asked if they had anyone doing well on the platform I may be able to feature. That’s how I connected with Kat, the Zazzle designer, Catherine, the EatWith chef, and several of the other successful side hustlers featured in the book. The second was HelpAReporter. I’ve used this service as a “source” many times in the past; it’s a great way to get press exposure and backlinks to your site. It was actually through HARO I met Alexandra Kenin, whose story about tapping into big travel marketplaces to build her side hustle was a perfect fit for the book. We ended up recording a podcast episode about her business of leading urban hikes in San Francisco as well. The third place I turned was the Side Hustle Nation community. It was through the Facebook group and email list I connected with Janelle Jones, an Airbnb host in Atlanta, Dan Khadem, a Wyzant tutor in Denver, and several others. Because the book ran 20k+ words longer than I’d anticipated, I was about a month behind on my projected timeline. And worse, there were still parts of the book I wanted to expand on and find illustrating examples for. But there comes a time when perfection is the enemy of good enough, and I had to call it if I wanted to ship by the end of September. For editing and proofreading, my wife Bryn took the first pass. Then I handed the book over to Elizabeth Stockton from ClearSharpWriting.com. Elizabeth is a professional editor and a member of the Side Hustle Nation community, so it was a good fit. I was actually pretty nervous to hand over “my baby” to an editor, in case she thought the whole thing was horrible and needed to be re-written from scratch. That would not have meshed well with the launch timeline! Thankfully, Elizabeth didn’t feel like a wholesale re-write was in order. She turned the edits around quickly and just a few days later I had my 2nd (and “final”) draft. This was a big investment and one I hadn’t made since my first book project, where I found an editor getting started on Elance for around $100. If you have budget for editing, I think it’s money well spent. And if you don’t, at the very least have one or two trusted readers go over your book before hitting publish. My new hack: Even after 3 rounds of proofreading (mine, Bryn’s, and Elizabeth’s), I still found typos in the text while recording the audiobook. So not only was I producing another sell-able asset, reading the book aloud word-by-word helped uncover a few more small mistakes. More on the audiobook below. While the book was being edited, I set out to create the lead magnet for the book. Or rather, lead magnets I should say. With my previous titles, I’ve included one book-wide bonus offer, that readers can get in exchange for an email address. The standard practice is to put this offer in the front of your book so it’s visible on the Amazon “look inside” feature even if people don’t buy. This strategy has added over 1000 people to my email list. I’ve even tested making a book permanently free on Amazon for this sole purpose. For Buy Buttons, I wanted to step up my game. I borrowed Kevin Kruse’s “Chapter Upgrade” strategy and created 4 different bonus offers in the book. I plugged each one in context and at the beginning and end of the book. Shameless plug: Don’t those bonuses sound great? You can check out them out here, even if you didn’t get the book. So far, more than 500 people have opted-in for them. From 2600 sales, that’s nearly a 20% conversion rate! The upgrades provide “next level” content or different strategies than those discussed in the book. I created them quickly by selecting podcast notes that complemented the chapters. I used LeadPages to create the landing page and handle the file delivery. At this stage of the game, I knew I wanted to call the book “Buy Buttons” — I think it has some nice brandable alliteration, and is a phrase I’ve mentioned on the podcast before in reference to the platforms and marketplaces explored in the book. But I didn’t have a subtitle, and that proved to be a bottleneck. After all, you can’t get your cover made until you know what you want on it! I started by doing some keyword research, using the Google Keyword Planner, Merchant Words, and Dave Chesson’s new KDP Rocket software. I found some interesting data. For example “entrepreneur” gets a lot of searches, but is also super competitive. In the subtitle, I chose to target phrases like “make extra money” and “start a business” instead of some of the more competitive terms. Note: This is a fun way to build pre-launch buzz too. The problem was the groups didn’t agree! The launch team, which was more familiar with the content of the book, overwhelmingly chose the “300+ Ways” title. I hemmed and hawed over this decision for days. I know “number titles” can work really well, and I didn’t really want to overrule my launch team … but the results from the other group kept me up at night. It would have been interesting to split test with a live audience, but alas, not possible. I had to make a decision and move on, because I needed a cover designed and this was holding up progress! Pet peeve: “earn money” is more accurate. Only the mint “makes” money, but gotta go with what the people are searching for. For the cover, I knew I wanted to give DesignCrowd a shot. They’d been sponsoring The Side Hustle Show podcast this year and I was excited to test out their crowdsourced design service. The basic concept is this: several designers submit their ideas and compete for your business. Naturally, the more you pay, the more designs you can expect to attract and theoretically the higher quality they’ll be. This was a little tough for me, since I’d never spent more than $5 on a book cover before. Well, that’s not true. I’d bought a few Fiverr’s in search of a winner before. But still, my DesignCrowd contest was big money for me so I had high hopes for an awesome cover. In total, I received 35-40 design submissions from 13 different designers. Some were just plain awful. Some couldn’t even be bothered to spell the title correctly. And some I really liked. It was cool to see such a variety of interpretations and designs come in. I think that’s the biggest advantage of a crowdsourcing service like DesignCrowd. I was able to communicate back and forth with the designer to test out different color variations and different graphic options. The blue version actually tallied the most votes, with people making great arguments for their choice in every direction. This was another stressful decision point that I was definitely over-analyzing the crap out of! 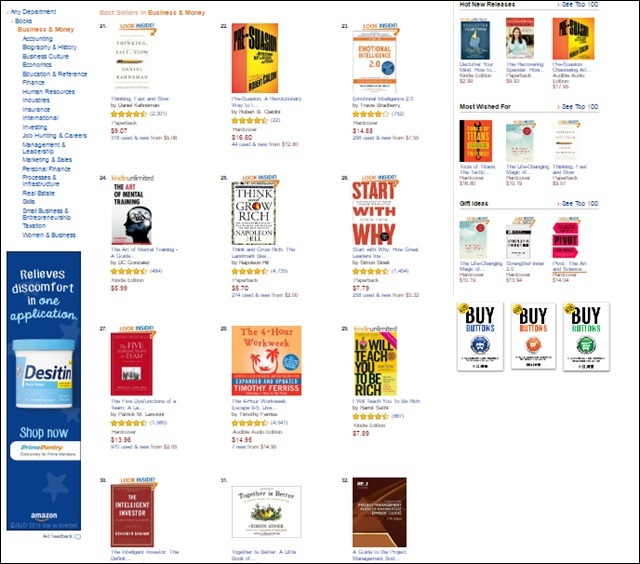 It wasn’t until I superimposed those thumbnails on a page of Amazon business book bestsellers did I make up my mind. 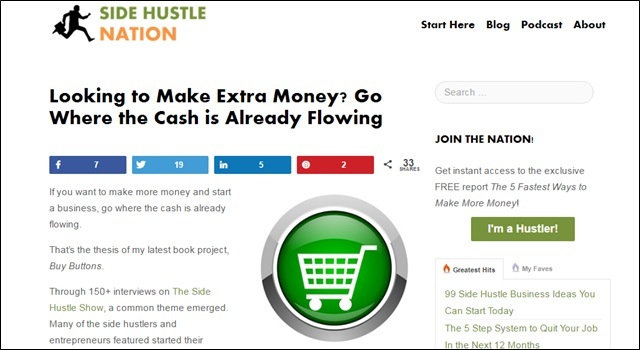 Plus, like many people mentioned, green symbolizes money and fits well with some of the green branding on SideHustleNation.com. I used PowerPoint to make my paperback cover. I used Calibre to convert my .docx file to .mobi for Kindle. The paperback formatting took a little more time, using CreateSpace’s digital previewer to make sure all the page and paragraph spacing looked OK. Going through page-by-page was tedious and time-consuming. I also bought my own ISBN, instead of getting a free own through CreateSpace like I’ve done with all my other books. The reason is this theoretically gives you more flexibility on distribution, particularly in brick-and-mortar stores. That’s a project for another day, but for $99 I wanted to leave that door open. This is important: I wanted to have both the Kindle and paperback editions uploaded to Amazon several days before the launch. This would give me time to quietly collect pre-launch reviews, make sure both editions were syncing to one sales page, and to set-up my “vanity domain” redirect. It would also give me time to claim the book in Amazon Author Central, to have it linked to my Amazon author page. I’ve seen other people upload their books and set a release date in the future to try and collect pre-orders. While that can work if you have a big audience, for most authors you don’t want to send people to your book on launch day and have them see a big fat zero reviews. That’s why if you look closely you’ll see a publication date of September 16th, while I didn’t launch “publicly” until the 26th. After hearing Pat Flynn mention that the audiobook for Will it Fly outsells both the Kindle and CreateSpace versions, I was determined to test out this new medium as well. Even for someone who’s been recording and editing audio for the last 3 years, this was BIG challenge. It was really difficult to read my own work word-for-word with intonations that made sense. It took several days to record and edit what amounted to 4 hours of audio. The silver lining is the process uncovered several more typos and mistakes I hadn’t caught before. I’m still working with ACX to get final approval on the files. Big thanks to Scott Panfil for all your help! Update: You can get the audiobook version free with an Audible trial! I’m excited to explore this new potential sales channel and revenue stream. And that about wraps up the content creation side of things. Ready to learn about everything that went into the marketing? Let’s do it. One of the cornerstones of the Buy Buttons launch was having a dedicated “launch team.” Basically this was a group of awesome individuals who agreed to help me in the writing process, read the book early in exchange for an advance copy, and leave a review before or during the launch week. For their efforts, they got a free copy of the book before everyone else and I promised to do my best to share all the “behind-the-scenes” production and marketing stuff I could. I searched high and low for a detailed launch team “how to” or case study, but didn’t really find one, so I made it up as I went along. UPDATE: Karen Dimmick has put together a great step-by-step launch team guide here. By replying to an invite in my newsletter. By replying to a Facebook thread in the SH Nation group. 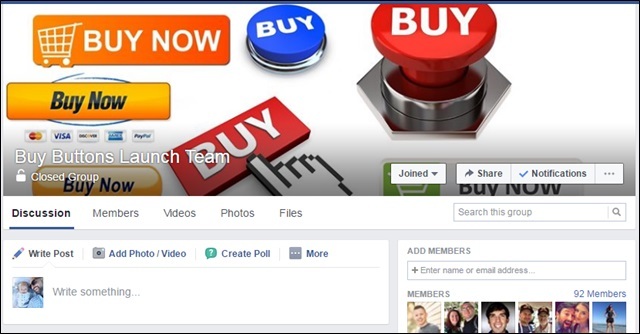 By joining the launch team Facebook group after an invitation to my Udemy students. By opting in while answering a round-up post question. I also maintained an Excel spreadsheet with all the people who’d requested to join as well, and used that to email people directly. There were 92 people in the FB group and another 80 in my Excel sheet (with lots of overlap). Examples of what I’d share with the group would be updates on the writing process, keyword research, marketing plans, etc. I tried to update them or give a video of what was going on with the book every few days. One of the more innovative ways (if I do say so myself) I recruited launch team members was through a round-up post on Side Hustle Nation. I asked 40 or so author friends for their best book launch tips, which turned into this post. I think this one could work well if you don’t have a big audience. I’d reach out to influencers in the space your book is trying to reach. Another alternative if you don’t have an audience of your own is to use a service like MyLaunchTeam to help build one for you. I don’t know if “vanity” domain is the official term, but that’s what I’ve been calling BuyButtonsBook.com — basically the practice of registering a dedicated URL for your book. This gives you an easy to remember URL to mention on podcasts, in blog posts, or on marketing material. Plus, I think it sounds cool. I mentioned this URL on the podcast a few times leading up to the launch and also on the blog. 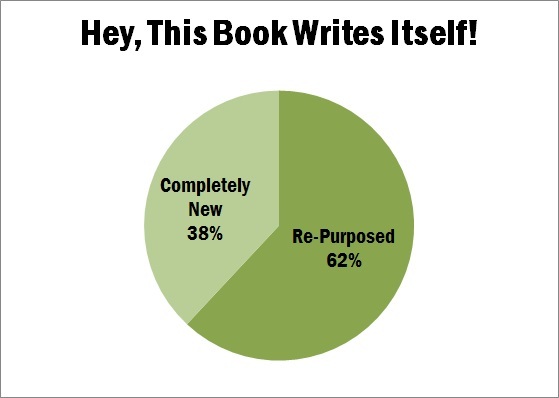 It only generated 24 sign-ups, but those people were highly likely to purchase when the book came out. Once the book was live, I redirected the BuyButtonsBook.com vanity domain straight to the book’s sales page on Amazon. 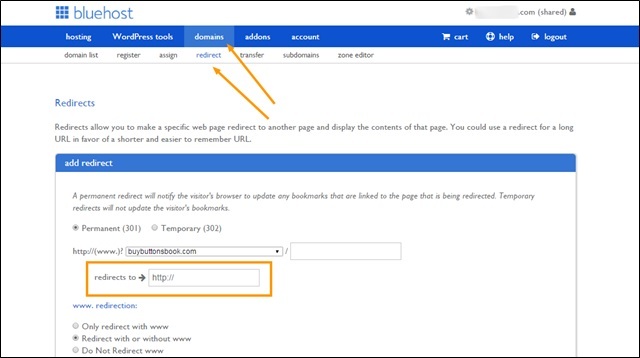 I chose to run my redirect through an Amazon localization service called GeniusLink. One frustrating thing about Amazon is they have different stores in different countries, like iTunes. That means your book might have 65 reviews in the Amazon US store, but only 5 in the Amazon UK store. But beyond that issue, it’s a frustrating user experience for international customers when a link takes them to the wrong Amazon store for their country. Geniuslink solves that for $9 a month, plus lets you earn affiliate commissions on those otherwise lost sales as well (as long as you set up an Amazon Associates account in all those other countries). Because I gave myself almost 3 months to complete this project, I had plenty of time to tease it out and build some buzz. I think my first mention of the book was in my first 20 Questions episode, which aired on July 1st. For people who stuck around to the end, I said they could get a free copy by leaving a comment on the episode. Around 17 people took me up on it. 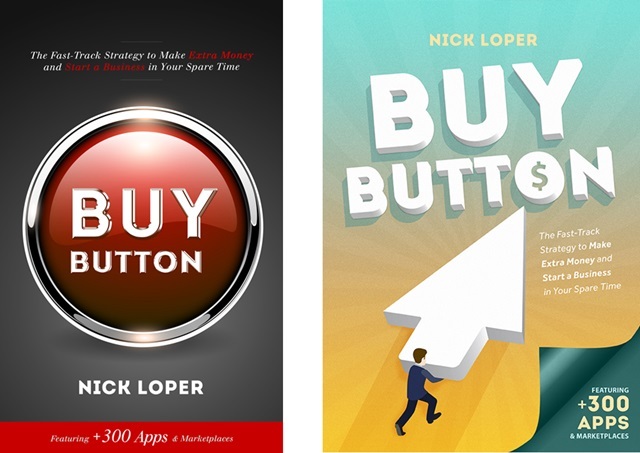 On September 1st, I aired an episode with Tom Morkes on book launch best practices, and for the rest of the month ran a mini-series of “Buy Buttons”-themed episodes. We covered marketplaces like Etsy, TripAdvisor, and Amazon. Each week I’d plug the vanity domain and let listeners know the book was coming soon. Although the blog doesn’t have quite the reach the podcast does, I wasn’t about to ignore it. The main mention was in the round-up post mentioned above. Since it was all about book marketing, it was a natural tie-in. This was a lot of fun. Since I was heading to the FinCon conference the week before my revised launch date, I wanted to use my interactions to build some buzz for the book. Since the book was launching at $0.99 I actually went to the bank and got $50 in one dollar bills and paper-clipped them to the stickers to “give away” the copies. It ended up being a great conversation starter at the show and I’m confident it moved some units as well. Up until this point, I hadn’t mentioned anything about the book on my personal Facebook account. I’m mostly active in groups, and don’t post that many status updates. The paperback proof had just arrived back home and she managed to capture our little hustler being the first to check it out. Do you like how we’re 4000 words and almost 3 months into this post, and we’re just now getting to launch week? This project really stood on the shoulders of years of platform building and soaking up all the marketing insight I could. The first order of business on Monday morning was equipping the launch team with some social media firepower and letting them know it was go-time. By this time, the book had collected more than 20 5-star reviews on Amazon so the sales page had plenty of awesome social proof. I used a tool called hrefshare to generate click-to-share social media posts for Twitter and Facebook. In fact, the link still works if you want to test it out and share the book. This was purposely an image post and NOT a “link” post, with the theory that the Facebook algorithm doesn’t love posts that take people off of Facebook. Once the launch team was armed and dangerous, I turned my attention to email. First, I messaged the group of people who’d opted in specifically to be notified about the book. Each of these messages went out to 15% of the list. As you might expect, the more vague one had a slightly better open rate, but the more direct one generated more clicks. And since you can’t sell books on open rate alone, I sent the more direct subject line to the remaining 70% of the list. 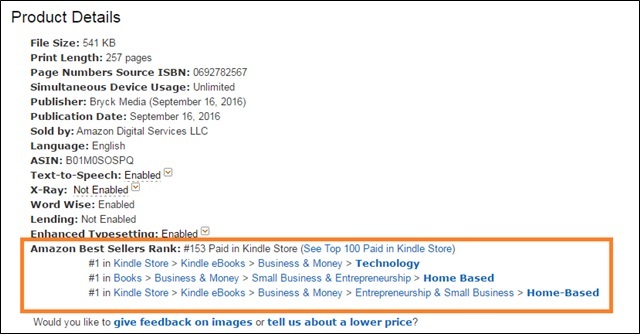 The social media blitz and the email drop combined to push the book to its highest positions on Amazon. That Monday, it sold 705 copies, earned the coveted bestseller badge on the first day and hit #1 in several subcategories. Throughout the week, I messaged my list a couple more times. Once was on Thursday for my regular weekly newsletter (subject line: 300+ ways to make extra money), and the other time was on Saturday, the last day of the $0.99 promo. If you don’t have a big email list, there are a few other things you can do, including renting someone else’s which I tried as well. There were a lot of contributors and stakeholders in the book. I’d already messaged most of the people featured and given them a free copy, so the next stage of my email outreach was to the companies featured and marketplaces included. This worked really well with Work Smarter, but I actually didn’t see as much traction on this strategy this time around. I think selling the book–even for just $0.99–instead of giving it away for free created a barrier that many companies didn’t want to share it on social. When launching a book, I’m trying to think of how I can get it in front of as many people as possible. You might be surprised by how many channels are out there. 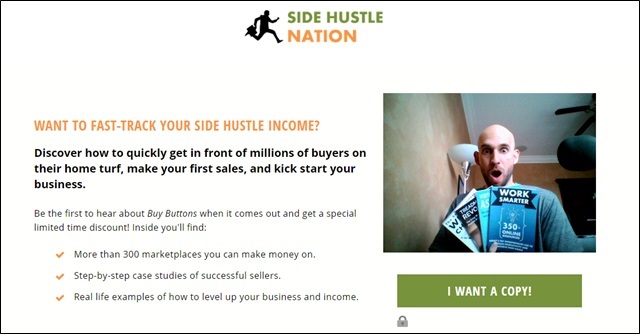 I posted about the book on the Side Hustle Nation blog. I pinned the book cover to Pinterest. 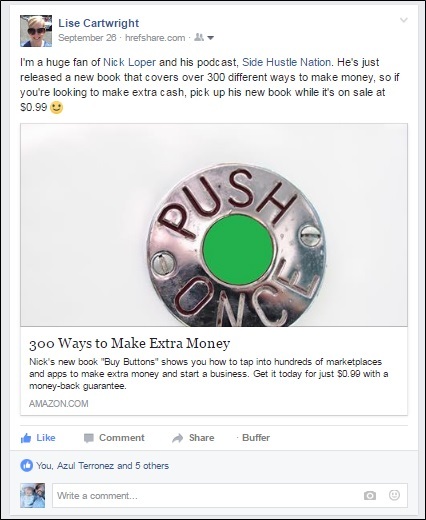 I posted about the book from the Side Hustle Nation Facebook page. I actually spent a little money and boosted this post so it would reach more people. 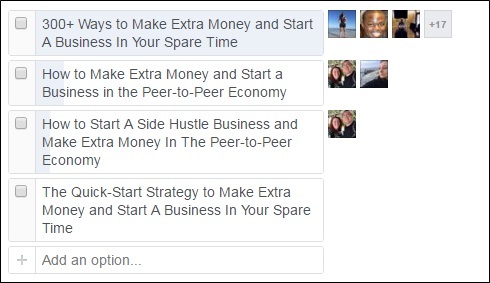 I think I targeted people who liked the Side Hustle Nation page and their friends. Worth it? Hard to measure. I don’t think $0.24 per engagement an amazing advertising result, but it was also a relatively inexpensive way to get another touch point. If you don’t have a big email list, you can actually pay to “rent” space from other people and companies who do. 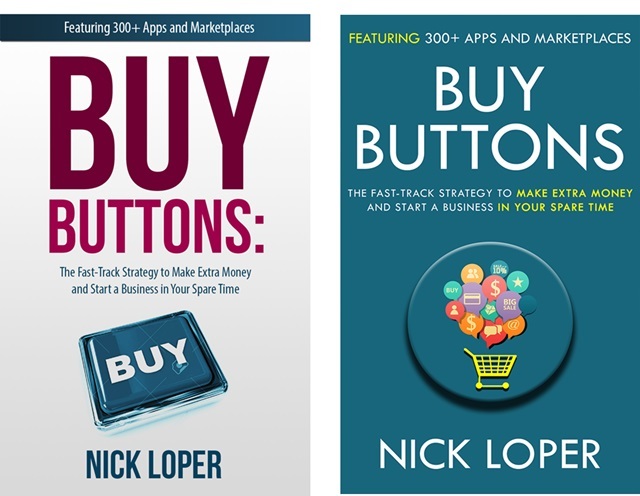 It’s a great way to borrow someone else’s audience, and I tried a handful of book marketing services to support my own efforts on the Buy Buttons launch. I did my best to space these out throughout the launch week, since I believe the Amazon algorithm rewards consistent sales over a big spike. It’s hard to measure the effectiveness of these campaigns since I had so many other marketing weapons all firing at the same time. Still, it was a way to get in front of a wide audience of proven Kindle readers who probably never heard of me. While I definitely did a lot of marketing for the book and put a lot of effort into creating a quality product, there’s always more I could have done. For instance, you didn’t see me on Snapchat. You didn’t see me on a “podcast tour.” And you didn’t see a dozen other bloggers all promoting a free copy of the book to their list in the hopes of making a big-ticket affiliate commission down the road. 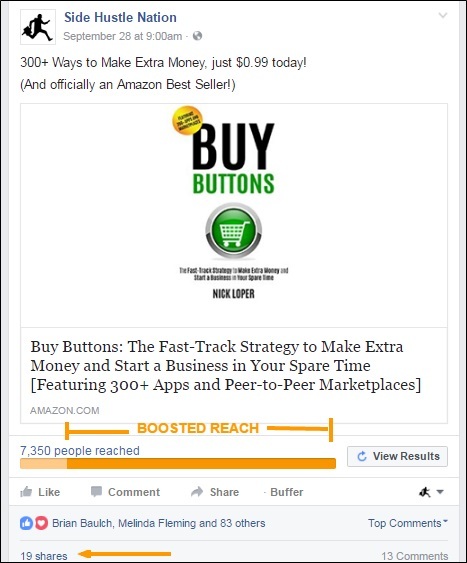 A book like Buy Buttons actually earns money in several different ways. The first and most obvious is straight ebook sales. Unfortunately, at the $0.99 launch price point (the tallest spikes on the chart), I only earned a 35% royalty. All that as added up to $2614.31. Since I enrolled the book in KDP Select, the title also earns money through Kindle Unlimited. The payout structure confuses me, but my understanding is Amazon pays authors based on how many pages are read, using some sort of normalized font size algorithm. For September, the book earned $67.36 through participation in this program. From what I can tell, authors earn about half a cent for every “page” that gets read. For October, the data isn’t out yet, but I’m estimating around $275 in income from borrows. The next way the book earns money is through sales of the paperback edition. I priced the paperback at $14.99, and have sold 82 copies so far, earning $408.01. When the audiobook is available, that will be a new revenue channel. The book launch also generated a nice spike in my Amazon Associates earnings. Because the BuyButtonsBook.com link runs through my associates account (actually a handful of global Associates accounts through Geniuslink), the launch traffic resulted in approximately $479.58. I say “approximately” because I forgot to create a new tracking ID and am not including the few cents earned on the foreign affiliate sales. The next indirect revenue channel from this project are affiliate sales from within the book. 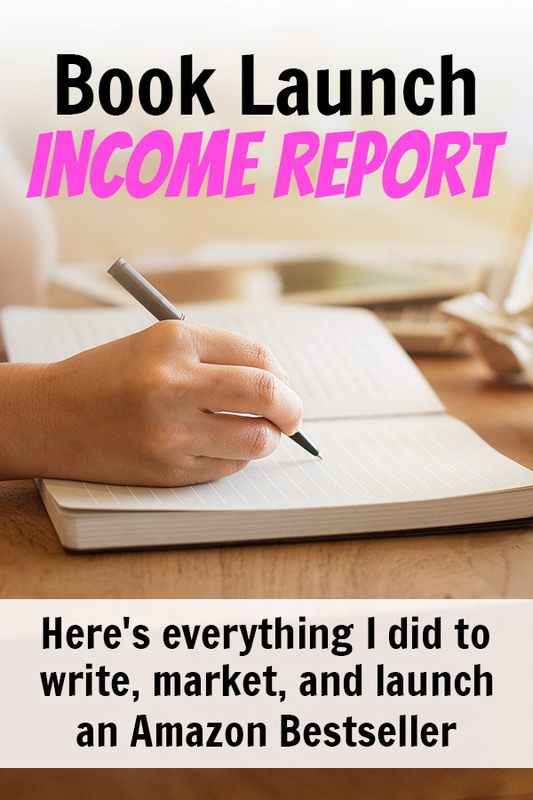 Again, these are tough to track back to the book directly, since I used many of the same referral tracking links as I use on Side Hustle Nation. Because of that, I don’t have an estimate of earnings from this channel, but it’s likely greater than zero. All in all, I’m happy with how it went, and will of course be happier if the book continues to sell for months down the road. If it continues to move just 10 copies a day, that’s a $600 a month passive income stream. There are definitely other activities I could do (and that we could probably all do) that are more profitable in the near-term than book writing, but this project really was a ton of fun to compile and it’s something I see as being a great long-term asset for Side Hustle Nation. For the sake of comparison, in 2014 Work Smarter earned about $1400 in its first month after launch. At that time I did a 5-day KDP Select free promotion as I had less than 1000 people on my list. While there definitely were a lot of things that went right for this launch, there are a couple things I might do differently next time. The first is having the audiobook available at launch. It would be cool to give people 3 different format options and have them all be available when the biggest marketing push is happening. One thing I’d like to try, especially for Facebook, is to create a 60-90 second video trailer with cool animated text. I’d be curious to test out something like that as a boosted post and see how the performance compares to the static link / image post. Adam Houge advised on the podcast not to blow all your promotion efforts on one day, but to trickle sales at a “slow boil” until the final day, when you go all out. The idea behind that is to spike the sales as high as you can before you raise the price to give yourself the best chance for visibility at the higher royalty rates. The secret to sustained sales is sustained traffic, and that can come either from Amazon or your own efforts. I’ll have to explore some other ways to drive sustained traffic and conversions to the book. One thing I’m testing out is Amazon’s internal book advertising service. If I can figure out how to drive profitable paid traffic to the book, that would be a big win. 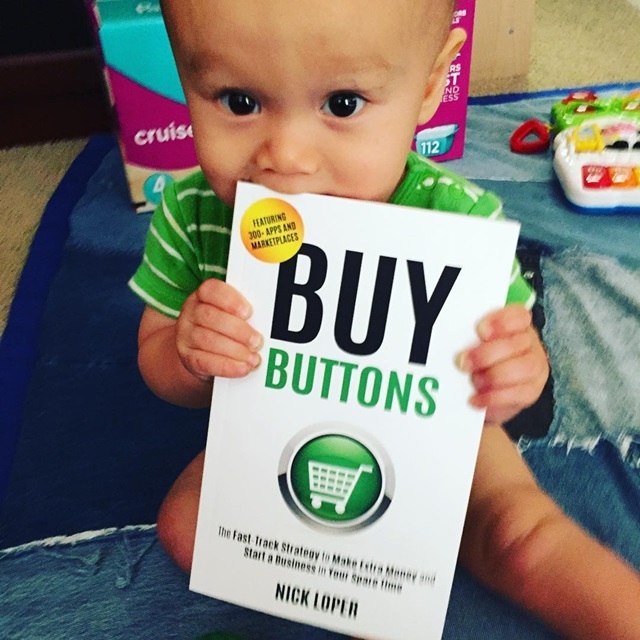 Thank you for all your support leading up to and during the Buy Buttons book launch. Did I miss something? Any other marketing tactics you would use during your launch? What would you do to drive sustained traffic to the book? If you haven’t got a copy of the book yet, I’d love for you to grab one and check it out. And if you want to learn more about Kindle publishing, check out my full-length course on the topic for a special blog-reader price. I’ll be updating it shortly with some learnings and lessons from this launch. Simply loved the post, Nick. 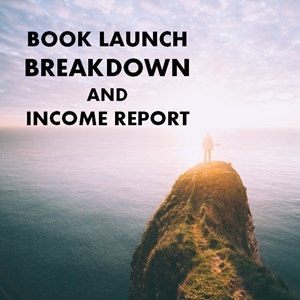 I used your Udemy course for my first book launch. I’m going to re-visit this blog post for all my future book launches. Thanks Jyotsna! And thanks for the tip to add a border to the cover — big improvement! You should do it Leslie. Anyway, Nick laid out all of the steps you need to take – the next step is to take action. Really in depth post Nick, I very much enjoyed reading. Your Udemy course was my first real lesson in the world of self-Publishing and I have really appreciated your other posts since. Congrats on a successful launch! for launch week. Is it possible to book them before the book is published? I think I did BuckBooks before it was published because I’d worked with them before. Then I just sent them the Amazon URL once it was live. I think they wanted to see a minimum of 10 reviews too. Since I had the book quietly live on Amazon before the big public launch, I was able to give 3-7 day notice for the other services. BKnights, then Bookzio, then BuckBooks at 99 cents. The following week promote on BookSends, AwesomeGang, etc. at 99 cents again. Keep doing this with as many sites as you can. You’ll increase your book rank, then make more money at the higher price. Then you’ll promote again at a lower price, and then increase the price again. THIS IS MY NOT-SO-SECRET WEAPON. You can choose your date as long as you give us a 48 hour window in advance. Most authors that do successful promos are usually a week or two in advance. Be sure to write down the dates that you pick between the promo sites so you don’t do too many on the same day. Congrats. I watched you climb the rankings. For people who are broke (or have 3 hungry kids like me!) you can definitely get these same results. Like Nick said, if you don’t have an email list you SHOULD use those services he mentioned. If you don’t have reviews, offer free copies to friends and family and make sure they leave an honest review. Amazon Marketing Services works great too. Just MAKE SURE you have a CreateSpace version priced at $14.99 (at least) because it will help you make more money. This is important when you’re paying for ads. Go on BuySellAds.com and browse relevant sites. Create a killer banner (I can’t go into that here) and post it for a month. You WILL see sales. Trust me, this is the BIGGEST advice I can give you. Buy banner ads to keep sales going. Excellent effort! Kudos to you for a very good idea very professionally executed. Even more kudos to you that you did a nothing held back explanation above for everyone to be educated. Thanks for this amazing post Nick – so helpful and insightful. I bought the book and enjoyed it and am auctioning lots that I picked up from the content. You’re a star in my world! I was in a rush to give this great book a big thumbs up! Great post! This is gonna get sent to my friends looking to publish! Damn that was a long read but really awesome – thanks for sharing all the details. Good luck with the future royalties and I look forward to hopefully getting some more updates in the next few months. I need to re-read this post Nick! I’m wondering did you self-publish btw? Your book launch was really a success and I’m so happy for you. I also published my very first book on Kindle but I didn’t follow all these processes to launch hence, I saw less success but I’m still happy to have taken action. I’m planning to starting writing my second book and to be honest, this post of yours have just given me so much insights and tips that I’ll be using come my next launch. I plan to also feature some influencers on the book and if you don’t mind, I’ll love to have you there so, I’ll send you an email regards to that when the time comes. Overall, this is a very wonderful post Nick, I’m glad to have gotten your email about it. BTW: I thought you can’t sell your book anywhere else even on createspace once you list it on kindle select? Epic post Nick! I appreciate your honesty. Big ups! You made it all back. I don’t know if it’s just me but I can’t find the share buttons. Thanks Daniel! Weird, they’re not showing at the top of the post for you? I’m just curious, is it still money well spent if you still found typos after spending hundreds of dollars? Oh for sure. I wouldn’t expect any human to catch 100% of the errors, and the text read MUCH better after her suggestions and fixes. Awesome post – thanks for all the details – one question, what do you put in a “press email”? It’s amazing to see how much “behind the scenes” work goes into a book. This is a fantastic post that I will definitely be referencing as I attempt to create my own side hustling guide. 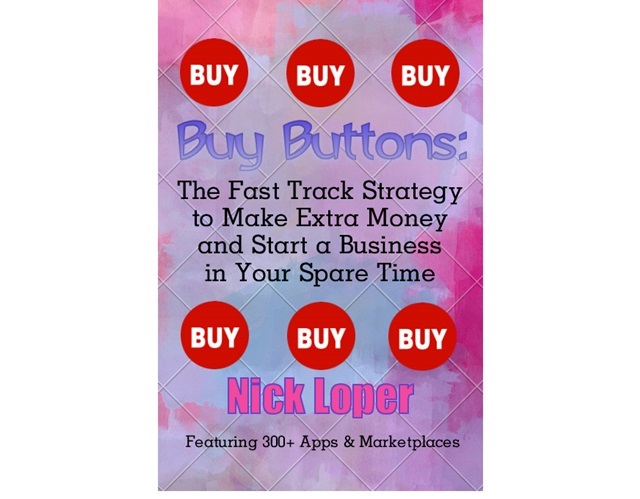 I would love to review Buy Buttons if your still looking for press through fellow bloggers. Although my blog is newly launched, it’s kind of unique here in Canada so I think it would garner you some new readers. Either way, I would love to collaborate with you in the future! Cheers! Your articles are truly amazing! That’s a lot for the great work you did! Great effort man. Keep it up your articles helps a lot to discover new things! Awesome article! We noticed that you mentioned our pricing and because of that, we wanted to reach out and let you know that we just launched a new pricing structure with the goal to help our clients become better marketers. We no longer have multiple “plans.” Now, Geniuslink users simply pay for what they use in buckets of 1,000 clicks for $2 each. Again, great piece and thank you for your voice in the space!